The "fight or flight" response is a normal reaction to physical danger, according to Dr. James Balch and Mark Stengler, authors of "Prescription for Natural Cures." It triggers brain chemicals you need to fight off or run away from danger. However, abnormal triggering of the fight or flight response, particularly when there is no physical danger, places stress on your body and mind. According to Balch and Stengler, certain supplements may help relieve abnormal anxiety associated with the fight or flight response. 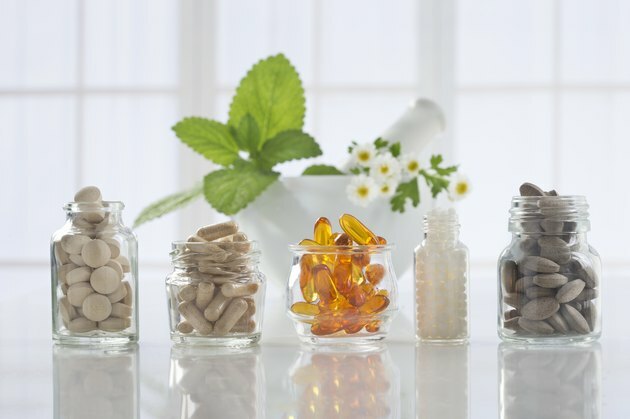 Talk to your doctor before treating anxiety with supplements. This condition may require medical or psychological attention. Take a 500mg calcium supplement twice daily, advise Balch and Stenger. This mineral may help soothe your nervous system, reducing the effects of anxiety. Calcium supplements may also help prevent stress from depleting your body of this important mineral, which can lead to bone loss. Take a supplement containing 250mg of passionflower once per day before bedtime. Passionflower is an herb native to Peru and it has a long history of use as a tranquilizer according to Michael Castleman, author of "The Healing Herbs." This herb is a natural alternative to narcotic tranquilizers, because it is not addictive. However, you should consult your doctor before using passionflower. Take a 50mg of a B-complex supplement twice per day. This supplement contains multiple B vitamins, including B6 and B12, that help calm your nervous system. B-complex vitamins also help regulate stress chemicals produced by your brain. Add a 250mg inositol supplement to your anti-anxiety supplement regimen. According to Balch and Stengler, inositol is a vitamin that may help reduce the frequency and severity of panic attacks. It may also soothe your nervous system. Take a supplement containing 300mg of valerian before bedtime. German physicians in the 12th century recognized the tranquilizing power of valerian, as did physicians in World War I. This herb may help ease stress and nervousness associated with anxiety. Check with your physician before treating anxiety symptoms with valerian--this herb may cause drowsiness. Support your supplement regimen with fresh, raw fruits and vegetables. These foods supply nutrients needed to manage stress and anxiety. Avoid processed foods and refined sugars, which can worsen anxiety symptoms. Avoid alcohol, caffeine and nicotine. These drugs can aggravate anxiety and trigger your fight or flight response.